Our workshops meet HUD guidelines. 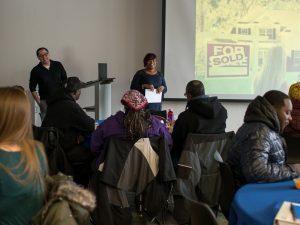 Completing an eight-hour homebuyer workshop is required by most lenders offering special loan programs and for most down payment assistance programs. It’s a great way to learn to make good choices as a first-time homebuyer. Workshops take place at various locations in Minneapolis. Sessions are open to any person or family thinking about buying a home. There is no minimum or maximum income limit. There is a one-time fee of $40 per household to cover the cost of supplies (including a detailed workbook you can keep). PRG also offers access to Framework, an online option. Framework is the only online homebuyer course designed by experts in online learning. It’s comprehensive, so you’ll have all the facts you need to navigate every step of the buying process. And you can learn when, where, and how you like. It even works on your smartphone. To get started, visit Framework. If you’d like to learn more first, watch this short overview video. The fee to participate in Framework is $75. All homebuyer education participants (whether online or in person) are welcome and encouraged to connect with PRG’s free home ownership advisors for individual assistance. PRG is by far one of the best non-profits serving the housing needs of our community. I recommend their homebuyer counseling services to my first-time homebuyers all the time.